As a general rule, the filter is either determined by the manufacturer or by your service company when they install your system. This is an often overlooked, but very important, aspect of system design. First we will see how a filter should be sized and then see what the options are for the everyday homeowner after the fact. Today’s high efficient system need to be able to breathe to achieve their rated efficiencies. There are many aspects to this but since we are talking about filters we will limit the article to that design aspect. Our system is a typical 3 ton heat pump. Airflow for this system is rated at 1050 CFM in cooling. 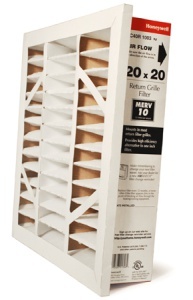 The factory filter is a cleanable 22 x 20. These cleanable filters should NEVER be used! So we will assume, for comparisons sake, that the installing contractor used a 20 x 22 x 1 filter (1 inch pleated). Our heat pump system has a static pressure budget of 0.25” WC. In the chart above you can see that at CFM 2 of 1050 (our heat pump’s rated airflow) that the static pressure is 0.234” WC. This means we could use this filter IF the duct system was in great shape; if the duct system is in bad shape this filter will increase the resistance to airflow too much. Since I do not have this size filter available in a 2 inch pleat we will look at a 20 x 20 x 2 pleat which is a SMALLER filter. Again, our static pressure budget is 0.25” WC. With the 2 inch pleated filter, even though it is smaller, we have a static pressure of 0.158” WC. As you can see the 2 inch filter will serve our needs MUCH better than the 1 inch filter. Even if the duct system is in good shape, using this filter will keep the system from struggling. This is the criteria your installing contractor should be using to determine the correct filter size; not just blindly following the manufacturer’s sizes and using any old filter. That’s great Robert, but how do I do this myself? I am glad you asked! The BEST course of action is to use your Air Conditioning company. Many times a simple call to a service manager, or even a technician who is at your home, can make the correct filter recommendation; at the very least they can get the ball rolling. You, however, are a do-it-yourselfer and want to do it on your own. Okay, I can give you some guidance here as well. We have already seen that the fiberglass panel filters allow good airflow, but also allow particles to pass through and cause problems with our system. Just adding a 1 inch pleated filter may be detrimental to your system if it is border line already. The best thing to do is upgrade to a 2 inch filter or even a 4 inch filter. Many cabinets allow for either a 1 inch or a 2 inch filter. It is relatively easy to remove the old 1 inch filter and just insert a 2 inch filter. Most return air filter grilles also will accept a 2 inch filter in lieu of a 1 inch filter. If you have return air filter grilles there is another, better, option as well. Honeywell, and some other filter makers, have a product available that uses a 1 inch header and 5 inch filter media. This allows the use a 5 inch filter in a standard return air filter grille if there is enough clearance behind the filter (no wood studs etc). These filters are also a higher MERV; generally between 10 and 13. If your filters are located next to your equipment, either in the equipment or in a filter base/panel/cabinet adjacent to it, you may need to have your A/C company install a new filter cabinet to accommodate the 4 or 5 inch filter. This is usually outside the skills of most homeowners. You air filters are a critical part of your HVAC system, and maybe your health. Regular system maintenance and changing filters in a timely manner are the two biggest things you can do to keep your system operating at peak efficiency! Using the correct filter and keeping it changed is the biggest thing you, as a homeowner, can do to protect your HVAC system!